Use a Nikon D80 w/sea+sea housing, twin YS110 strobes. 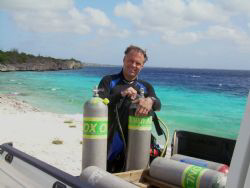 Have been diving since 1985. I was a critter guy before (I found everything rooting around in the shallows with a magnifying glass). I had a 1000 dives before I started lugging the camera around, found a clingfish on a night dive in Bio-Luminesence Bay P.R. and decided right there I needed a camera. Shooting for about 5 years now. Dive mostly in the carib. Spend most of my time in Bonaire, south end of Bonaire is my favorite, but it is all good!